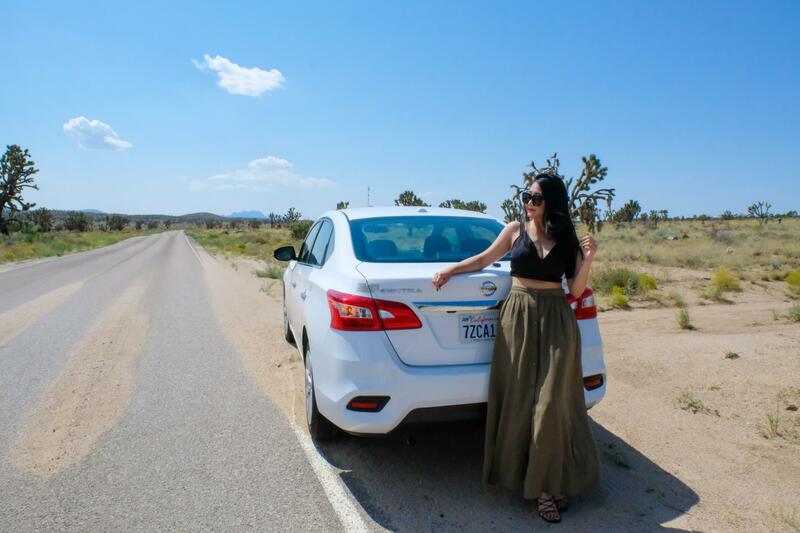 Beginning of September, I went on an amazing road trip adventure to the American Southwest and have been sharing some traveling hacks in the past few weeks. 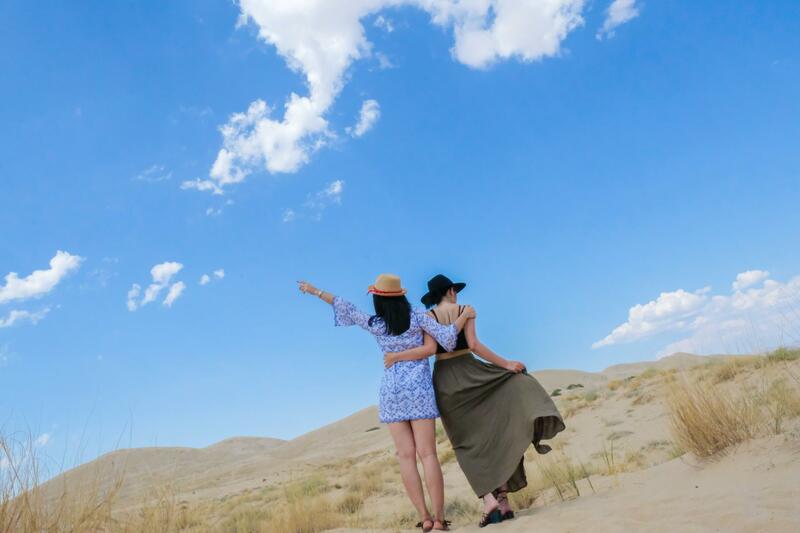 To conclude this series, here are some destination ideas for day trips from Las Vegas – if you’re not too hungover to drive that is. With so much that’s been going on in the rest of the world (Hurricane Irma, etc. etc. ), I feel like my social media and my blog are part of a safe haven that I can turn to to forget what’s happening around me. And this is exactly why I tend to not talk about these sorts of serious topics on here. I understand that traveling is very much a privilege especially when there are those dealing with difficulties who can’t necessarily afford such luxuries. Not really sure where I’m going with this. Guess sometimes the guilt just eats me up inside. This isn’t gonna be some kinda self-reflection post but I felt like I needed to get this off my chest. Thoughts and prayers to all those affected in recent catastrophes. And on with the juicy bits! When looking for fun things to do in Las Vegas, there’s no doubt that this magical art piece will appear in your search results. 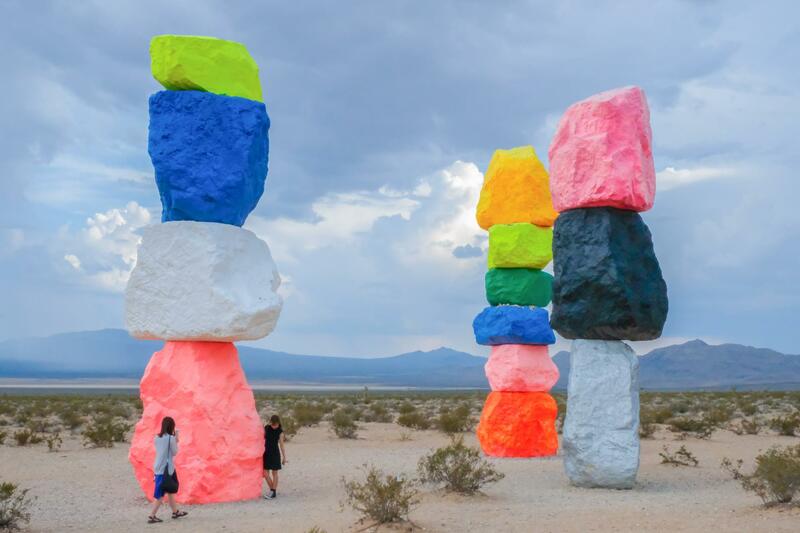 Seven Magic Mountains is a a creative expression of human presence in the desert. It reflects both concepts of nature versus artificiality as represented by the distant mountain ranges and heavy traffic flow between LA and Las Vegas. Made popular by Instagram, this is definitely the “it” thing to see. Although I bet you can’t tell it cost $3.5 million to install!!! 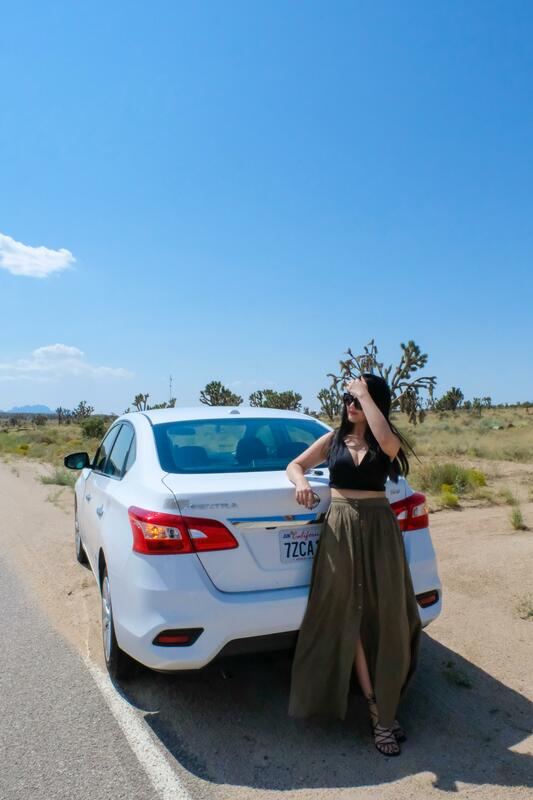 It’s an easy 30-minute drive from the strip and makes for a super cute photo shoot opportunity. We unfortunately came on a cloudy day (technically night as we arrived around 5pm). It was actually drizzling for a bit too. That said, there weren’t as many people. Is this really worth seeing though? I personally thought it was ugly to be honest. Then again I’m the sort of person who appreciates beauty in its most natural state. Hence I thought the desert alone was perfect as is. But you know what they say… Art, whether you love it or hate it, the purpose is to elicit a response. I’m probably contradicting myself here, but like I said, it definitely is a great spot for pictures. Be sure to add it to your list of things to do in Las Vegas and try see it while it’s still there! To learn more about Rondinone’s work, take a look at the Seven Magic Mountain website. I don’t remember how exactly I came across this beautiful desert on Instagram, but I did. And the moment I did, I immediately put it on my book of “things to see in Las Vegas”. Scenic drive en route Kelso Dunes. 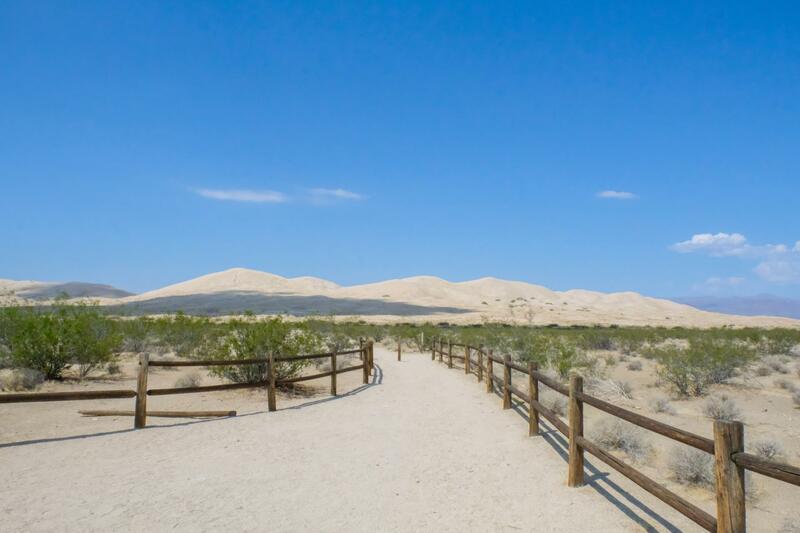 Located in the Mojave Desert, Kelso Dunes is southwest of Seven Magic Mountains and just a short hour and 45 minute-drive from the Vegas strip. This was probably a fail for us though since we technically didn’t even make it that far out. We walked for 20 minutes towards the peak and turned around because the sand was burning hot and practically scorching our feet. We knew we’d be walking and hiking lots. Which is why we’d worn runners for the whole time we were in the Southwest. Long and behold the time when we really needed to be wearing sneakers, we wore sandals. And only because we wanted to look pretty in our Instagram shots. (Lame.) Okay well in my defense, sandals and sand kinda go hand in hand. When was the last time you saw someone wear a pair of Nikes on the beach? 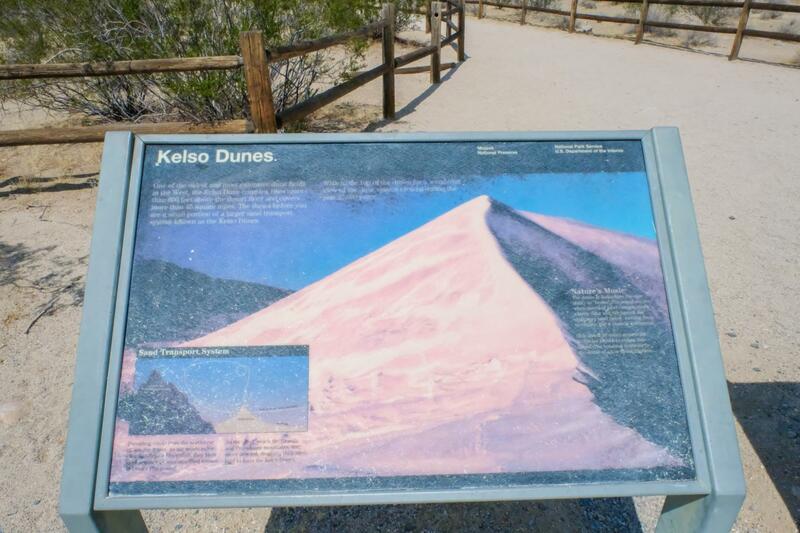 If you’re thinking of hitting up Kelso Dunes, just know that it’ll be a good hike to get to the peak and closed shoes are definitely encouraged. Oh and remember to bring water too! And there you have it! Two fun day trips from Las Vegas you could take on your next Las Vegas adventure. For more on what else to see while you’re in the area, hit up my previous posts on Horseshoe Bend + Antelope Canyon and Bryce Canyon National Park. Oh! Can’t forget about Grand Canyon of course. It was a major regret of mine not doing a helicopter tour over the stunning rock formations, but Rhiannon from Rhiannon Travels has shared her amazing experience (plus some awesome driving tips) in her “Visiting the Grand Canyon from Las Vegas” guide so be sure to give that a read! Previous Post What You Need to Know About Horseshoe Bend + Antelope Canyon ❥ Why our trip was an epic fail. Next Post A local’s guide to Hollywood’s best nightlife. Oh my god, everything about this is so drool worthy! I love love love your video in the beginning and your photos! Holy cow, so freaken adorable. I’ve always wanted to hit up that area of the U.S. and road trip to all the natural beauts and art installations there. But $3.5 million just to install a bunch of rocks on top of each other, like whattt??? I would have never guessed in a million years it cost that much. Thank you so much Alex!!!!! <3 And I know right, tell me about it. Imagine what you could do with all that money! I hear they're getting rid of it tho as it is too expensive to maintain hahaa so if you wanna go, you gotta be quick lol! Definitely! I was gonna say you could always check it out the next time you revisit but I do hear it’s getting taken down soon! Love your ideas! We visited Vegas two years ago, and I wish I knew about those two. We went further to Joshua Tree Park though, that was really good too. Joshua Tree Park is soooo on my list! Although we actually did pass by one in either Utah or Arizona. It was quite a small one tho. I love this guide and I feel like it’s speaking to me, haha. This would be my ideal way to enjoy Las Vegas. While I do love to explore the city and the strip, I think this would be a fun change from all the common ways to see LV! Oh definitely! And I mean your body can only handle so many days of being hungover right? You need a break and some healthy activities LOL! what gorgeous photos! your outfit is too cute! I have always wanted to visit this area of near Vegas, thank you for sharing! I saw a couple of friends went here but they never mentioned about the $3.5 mill. I wonder what the material of those art pieces? You made beautiful pictures though. Hahhaaa girl you gotta give your body a break from all that hangover sometimes! And strange enough, I always see people bring their kids to Vegas so you’d be surprised! Wow! That looks unreal. My boyfriend wants to go to Vegas in 2018 as we’ve never been to the USA at all & Vegas is a different place on earth. This makes me excited as I’m not a big gambler and would rather do a bit exploring around! There is a very beautiful park near Vegas: Valey of fire. You do need a car to go there. It’s awesome and beautiful. You can just drive around, hike, explore, have a picknick between the rocks. Highly recommended! 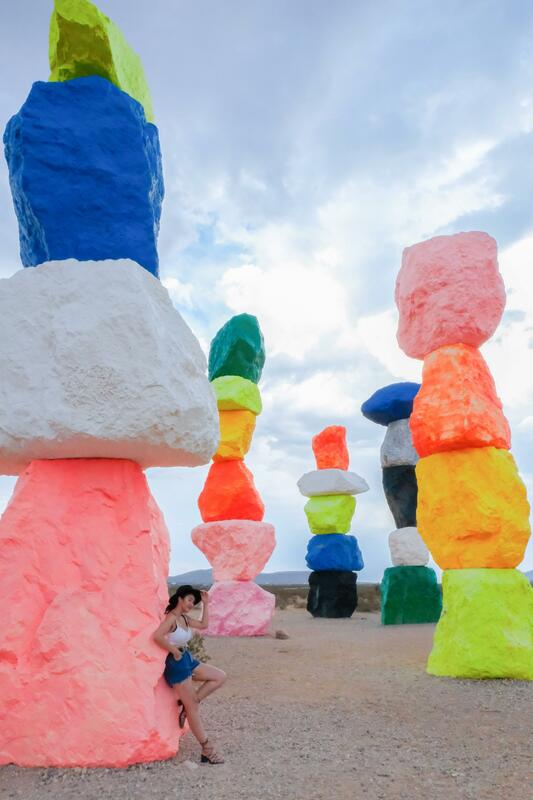 I really wanted to do the seven magic mountains last time we went to Vegas but we just didn’t have time – love your photos! Another idea for a day trip is going to the Grand Canyon. I took a helicopter there from Vegas and although it was expensive, it was definitely worth it. 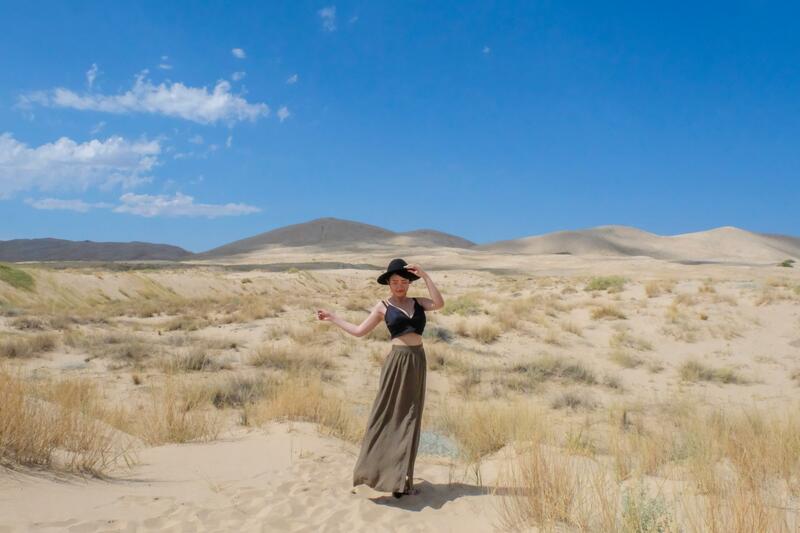 So much wanderlust going on in one post! Your pictures are beyond amazing! I love the fun facts about the Seven Magic Mountains. Definitely one for a bucket list! Thank you so much Yesh! Really glad to hear you enjoyed my photos since I wasn’t quite feeling them as you can see, cloudy skies don’t exactly make for the best photography setting. I’ve been to Vegas (too) many times. But only ever did a day-trip once. We went to the Hoover Dam and really enjoyed it. It’s easy to get to and a very cool thing to see. Just another idea to add to the list! Really cool video and pictures! What camera did you use to shoot them? If I ever go on that road trip along the West Coast, I’ll make sure to check out the Death Valley and Las Vegas. Thanks so much Pauline!! I use a mirrorless camera – Fujifilm X-Pro 2 🙂 And I’m totally with you about the rocks. They’re cute for photos but Mother Nature is beautiful on her own as well! Love your photos and video! Makes me want to go back to Vegas just to make theses side trips. 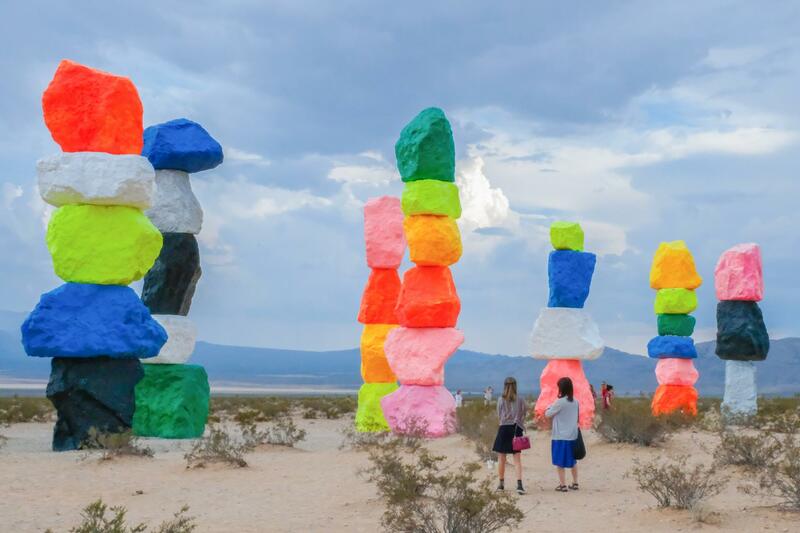 Seven Magic Mountains looks absolutely beautiful but when I read that it cost 3.5 million to install this, I keep wondering whether it wouldn’t have been better to spend that money on more useful things like helping people in need. Well, but that’s another topic, of course and your pics are really great. My thoughts exactly!!! I’m so torn about the idea because of that but not gonna lie, they do make for a pretty cute photo backdrop. And thank you Daniela. Hope you enjoyed a wonderful weekend!! 3.5 million….seriously!? That is some crazy money! (They do look very festive though). 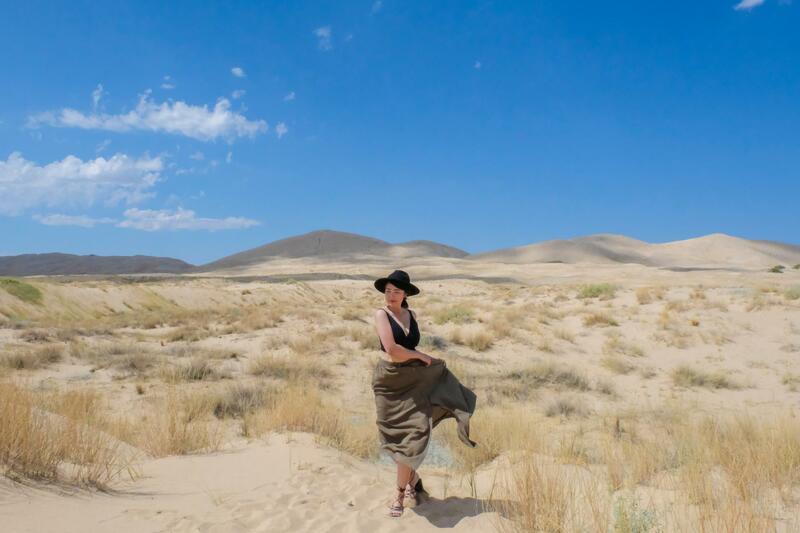 I think the natural sand dunes are more my thing too. Oh, and I get the sandals thing, trainers and a maxi skirt isn’t a great look. Great spot for Instagram photos for sure! Hahhahaa I feel you. Nature walks are definitely much more enjoyable when you reach that age where your body can’t physically handle the booze and the party no more. More than anything I love simply LOVE your photos and that video. 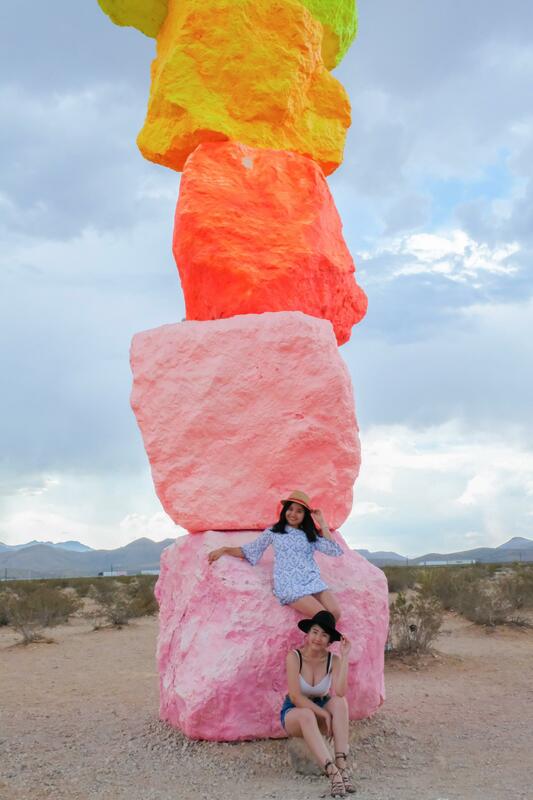 Didn’t know about seven magic mountains. Amazing post!!! Aww thank you so much for the kind compliments, Neha! There is so much to see and experience in Vegas beyond the party and casino scene. I love the landscapes around the place, it has a kind of wild beauty. The seven mountains look so surreal. The man made structures are so colourful and so contrasting with the wilderness in the background. There’s actually so much to see around the area. Hoover Dam, Grand Canyon… oh the list goes on! I definitely think Vegas/the American Southwest has something for everyone. 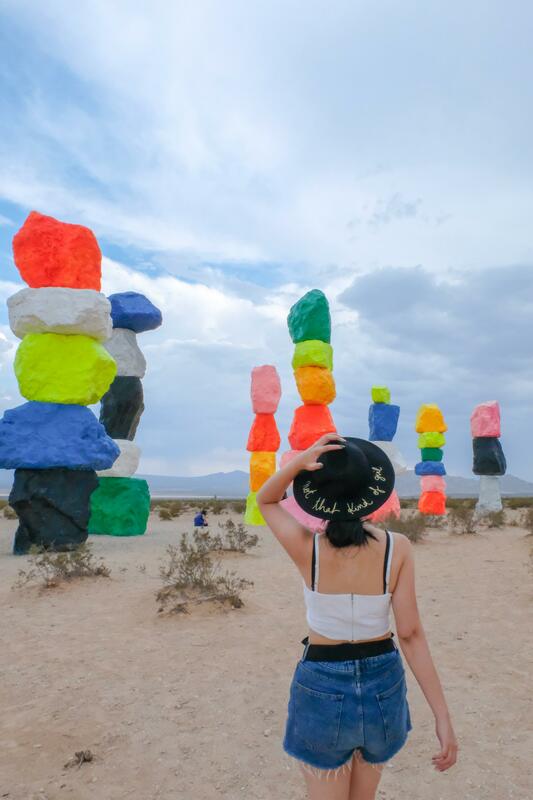 The colorful seven magic mountains is what I need to photograph and get on my Instagram. I know they are not there permanently but my Dad is in the area next week and I’m sending him to photograph them! I can’t believe how tall they are, when I saw the people stood by them. This is a worthwhile day trip from Vegas! This looks awesome! Two things I would never expected to see. I think I would love to go to Vegas particularly to explore outwith the main strip so this is great! Thanks for the tips! No problem Chiera! Vegas is full of surprises and I definitely recommend venturing off the strip!! The cost of that art installation! OMG! I guess I don’t think it’s ugly, but definitely not worth that! Definitely a cool place for an Insta photo, though. 100% agree with ya there. It’s crazy expensive but I’m definitely guilty for doing a photoshoot here hahaa. Fun ideas. I love visiting Vegas and have yet to rent a car and tour the area. Ikr!!!!! And yes, now you do! Hope you’ll get to check it out before it gets taken down! Just read over this for the second time! I have a friend from Spain coming to America this summer, and we are hoping to go to Vegas together. I’ll have to send this to her!! Hahhaa it’s a perfect alternative! Cheers Laura! I’m not really a Vegas fan but these day trips would be worth it for me to go back haha. 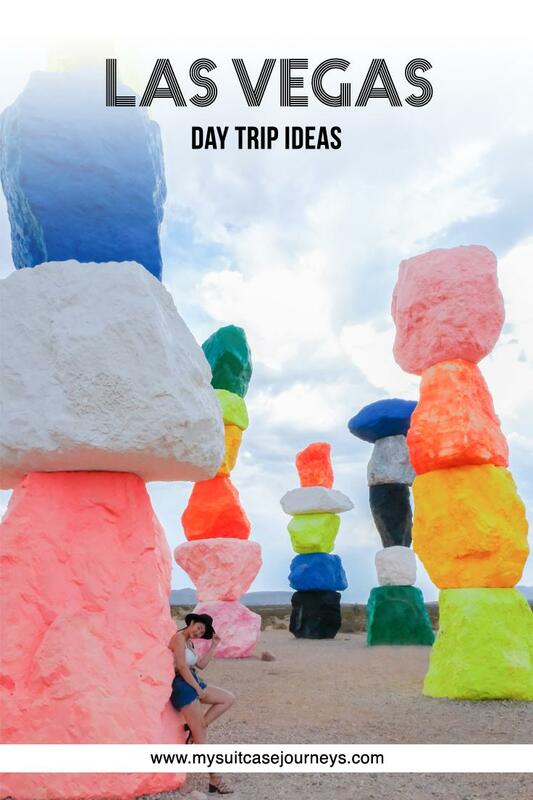 Especially the Seven Magic Mountains! I’ve since I started seeing photos of those I really wanted to go see them! Love your photos! I have never heard of these places and will definitely make a trip to see these when I visit Vegas again. Thank you so much dear! Hope you’re enjoying your weekend so far! I”m not usually very good with day trips – I promised myself to travel a lot during the weekends but I can’t make it, not even to Oxford which is like an hour by train from London! Shame and at the same time lucky you – the above ideas are cool so I’m jealous! and your khaki shirt is lovely! 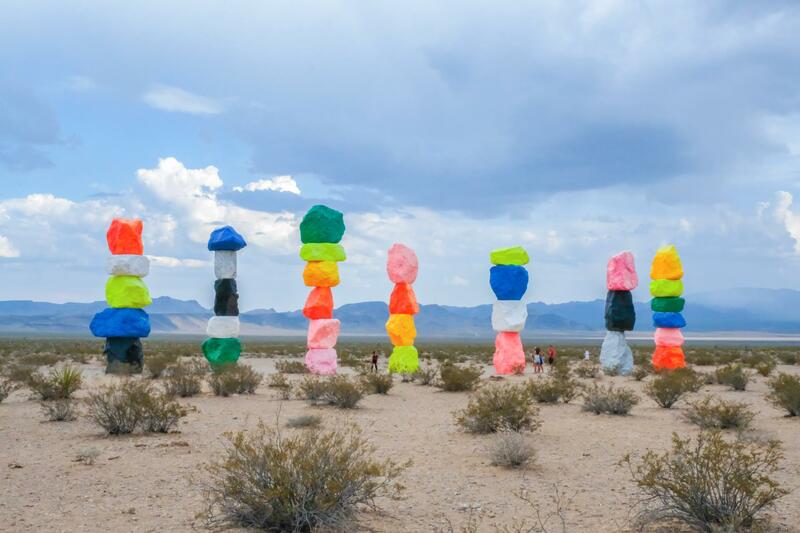 The seven magic mountains are so bright and colourful . 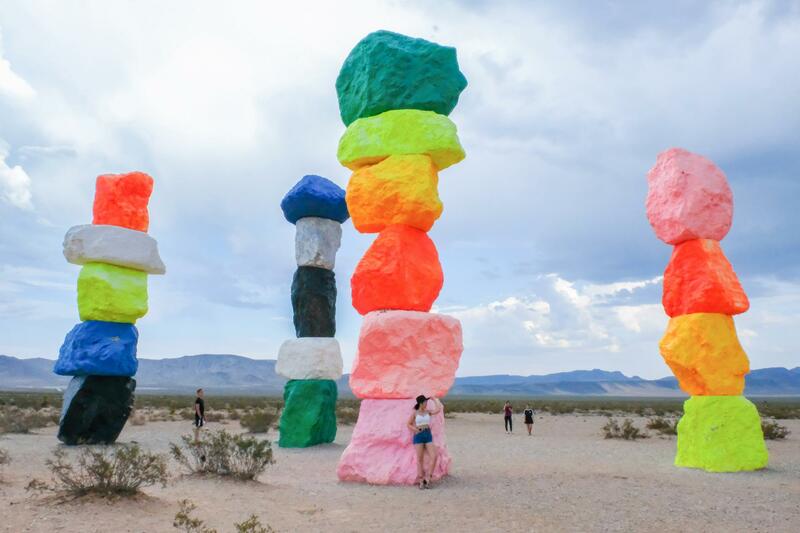 I’ve not heard of seven magic mountains and would love to visit! These are great day trip ideas. I’m bookmarking this for when we plan our road trip to the USA. Yay! Hope you’ll get to visit soon before they take it down!!! wow nice pics! when i think about vegas, i think about the flashy city. i totally forgot it’s in the middle of a dessert with still much to see. thank you for sharing! It’s great to see there’s an alternative to full on Vegas. I think the dunes would be my choice. I loved White Sands National Monument in New Mexico, and I could happily spend time here, just wandering. And I bet it’d me more of a workout than I expect; walking up dunes is hard work! I definitely didn’t expect it to be so difficult! The heat was really just the thing that made it hard for us to continue. And I’ll have to check out White Sands National Monument! Sounds like a lovely spot for a stroll! No problem, thank you Ali for the kind words! Great post and photos. Makes me want to pack my bags and leave right now. Should plan a visit to Vegas and the Southwest someday. Thanks Samuel! I highly recommend an American Southwest road trip. You’d love it! I absolutely love this post! I’ve been to Las Vegas twice, but never made any day trips like this. Both the Seven Magic Mountains and the Kelso Dunes are incredible. 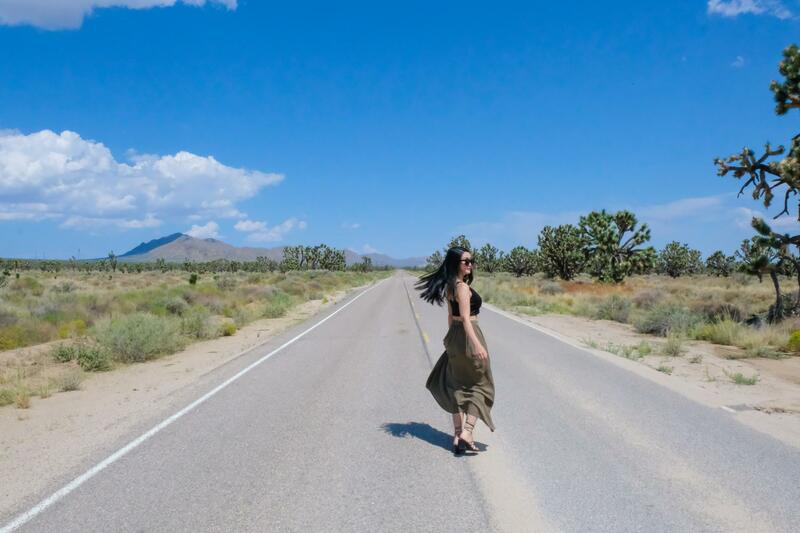 Love the remoteness of the location, and you look super stylish in your photos! Would love to see both places if I ever return to Vegas. Aww thanks Lisa! Definitely do make your way out the strip next time you’re back. I think you’d really enjoy the road trip destination options that are around the area! 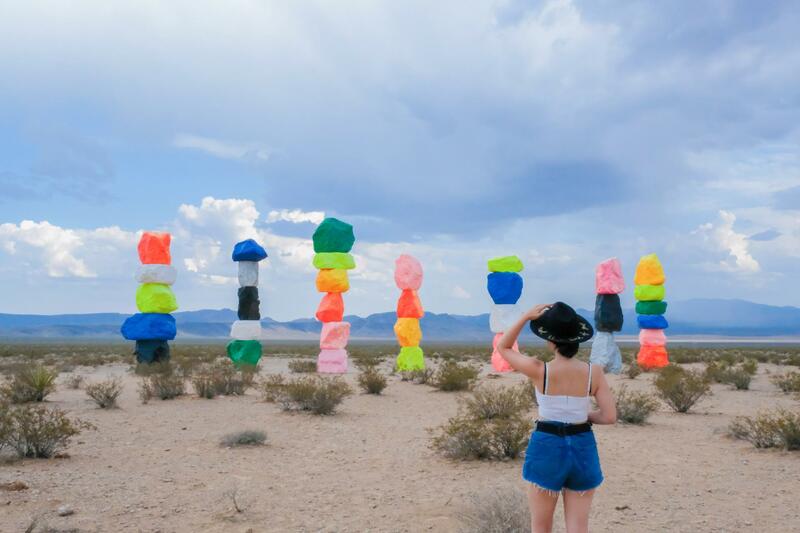 Wow, I did not even know about the Seven Magic Mountains or that such a place existed so close to Vegas. Haha, I like how you say ‘if you are not too drunk’, I had 2 days at Vegas when we went on our first ever trip to the US and somehow, it wasnt enough to get out of Vegas and explore other places. Can you imagine, I did not even make it to Grand Canyon! The colorful magic mountains look pretty cute though!